We’ve all experienced that nervous feeling when we have a presentation for an exciting potential new project or client meeting coming up. And we all know that preparing thoroughly for whatever challenge is ahead can help turn that nervousness into confidence. But, what is the best, most effective way to prepare? I subscribe to Scott H. Young’s newsletter – he writes about how to learn and think more effectively. A recent post concerned preparing for college exams – and I think the process he outlined can be adjusted to work for entrepreneurs and executives as well as students. It is his own system, but the ideas are drawn from cognitive science. When, and How Much, Should You Prepare? Obviously, more is better than less. But how do you prepare most effectively? Science tells us that spreading out your preparation over time, rather than cramming it all into one sitting gets better results. Review each item on your agenda several times, over the week before your conference or presentation. This approach produces the best grasp of your information with the least effort. And who wouldn’t cheer for that combination? How Should You Prepare? Do not simply review your written notes over and over. Make the information yours. Teach it to yourself. Write it down again, from memory. Write down ways it could be used in other situations. Ground Yourself in Core Concepts. Underlying any strategy, purpose, or plan are core ideas and concepts. The more deeply you understand these core concepts, the better you are at using them effectively, not to mention communicating them to others. Sit down with an understanding and patient friend or colleague, and explain these concepts to him or her. Without handy references to check. Change Anxiety to Confidence. Rehearsing your presentation is a great way to build confidence while you practice. Make your presentation to a colleague, a team member, or a friend. That provides the closest simulation of what you are preparing for. Ask for feedback to help you work out any kinks. Time yourself – how long do you want the presentation to run? After rehearsing, write down any new insights into your ideas and concepts. Explain how these new insights fit into the original ideas and concepts as thoroughly as you can, without reference to source materials or your notes. Do this more than once, close to the day you will actually make your presentation. Let yourself get anxious early, and you’ll be far less so when it actually comes time to present. 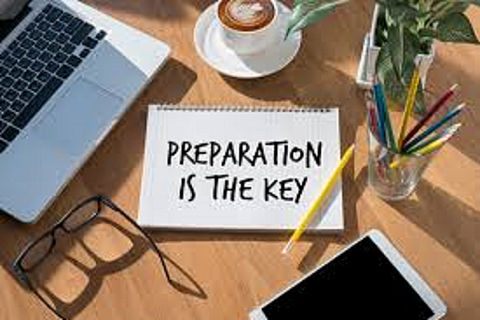 What methods of preparation work best for you? Please click here to email me directly – I would love to know your strategies.